Email attacks and phishing attacks are not going away any time soon. According to the 2017 HIMSS Healthcare IT Cybersecurity Study, almost 90% of all U.S. respondents report that phishing, and education about phishing, represent their top vulnerabilities and opportunities for improvement. 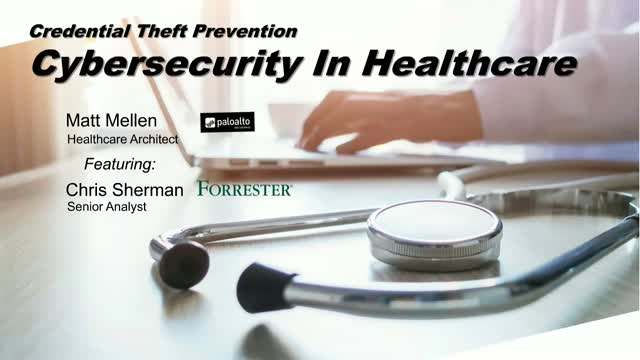 Join us for a webinar hosted by Matt Mellen, a healthcare specialist at Palo Alto Networks and featuring guest speaker Chris Sherman, Forrester Senior Analyst, serving Security and Risk professionals. Matt is Palo Alto Networks healthcare specialist who is a former IT Security Manager at a world-renowned hospital. Chris leads Forrester’s healthcare infosecurity coverage and has published multiple reports on best practices within the areas of healthcare and medical device security. * The current – and future – state of healthcare security. * Successful approaches your healthcare IT peers have followed to lower risks from phishing. * How to prepare your healthcare organization for credential phishing attacks.